Type catalogues are the ‘telephone dictionaries’ of taxonomy. It is very convenient to have all data for a museum collection together in one publication, especially if the the collection isn’t digitalised and data is spread over many publications. Pimenta et al. (2014) just published such catalogue for the molluscan collection of the Museu Nacional in Rio de Janeiro (MNRJ). In total 518 type lots have been recognised, representing 247 Gastropoda taxa, 30 Bivalvia taxa, 3 Cephalopoda taxa and 5 Scaphopoda taxa. After a very brief introduction, all taxa are listed alphabetically by class and by species name; the family name is included between square brackets. Some type specimens have been figured as well. In an appendix the taxa are listed per family. 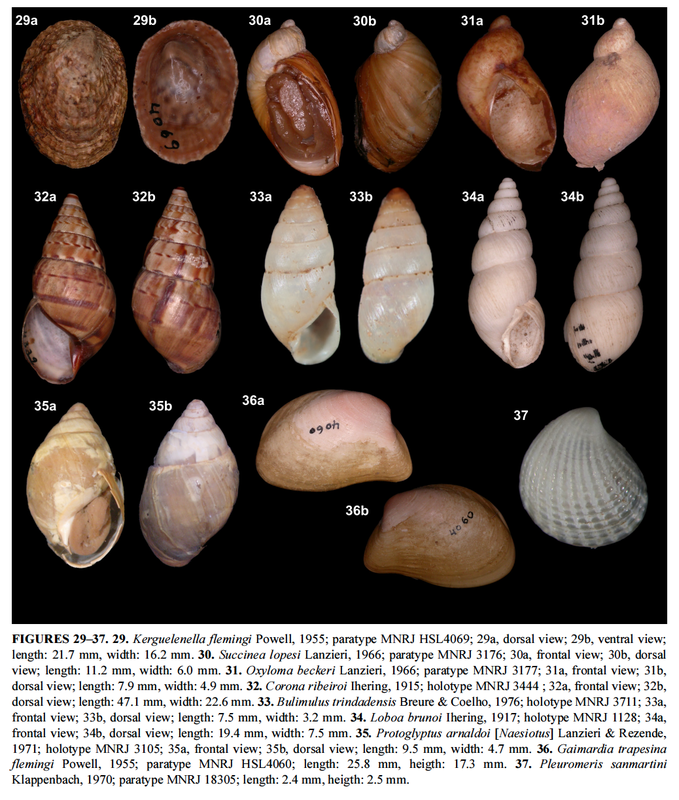 Land snail families represented are (number of taxa between parentheses): Succineidae (2), Charopidae (1), Orthalicidae sensu lato (29), Strophocheilidae (3), Clausiliidae (2). Of the latter family two taxa are excluded as types in the main text. In some cases the family names in the list do not correspond to those presented in the appendix; especially those belonging to the Orthalicoidea are treated in a confusing way (e.g., taxa belonging to the same genus allocated seemingly at random to one of two families). The family arrangement presented is clearly not up-to-date and conflicting with recent insights. Finally, it is clear that type material from several taxa has been exchanged or deposited in the MNRJ after the original paper had been published (e.g. several Weyrauch taxa), or that incorrect catalogue numbers have been published in recent works. All these data makes this ‘telephone directory’ useful for future reference. Pimenta, A.D., Monteiro, J.C., Barbosa, A.F., Salgado, N.C. & Santos Coelho, A.C. dos (2014). Catalogue of the type specimens deposited in the Mollusca collection of the Museu Nacional / UFRJ, Rio de Janeiro, Brazil. — Zootaxa 3780: 51–107. This entry was posted in Uncategorized and tagged brazil, bulimulidae, charopidae, clausiliidae, literature, megaspiridae, odontostomidae, orthalicidae, strophocheilidae, succineidae, types on March 26, 2014 by bramb.